Do you read a lot of books? Spend a lot of money on books? Then this giveaway is for you. A way to help alleviate the stress of your pocketbook for books. 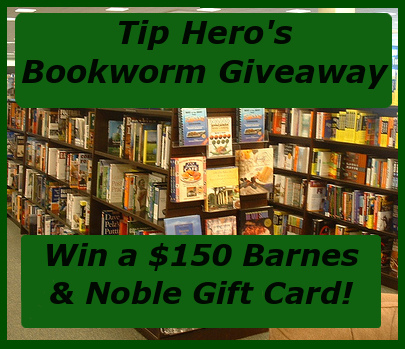 A bunch of bloggers have teamed up with Tip Hero for this fabulous giveaway of a $150 Barnes & Noble electronic gift card to one lucky reader! This giveaway begins on January 16th and will run for 2 weeks, ending on January 30 at 11:59pm US Eastern time. Open to United States & Canada, 18+. Enter below for your chance to win this bookish prize, by filling out the PromoSimple form below. Be sure to come back daily for more opportunities to enter. Good luck!